While every publisher recognises the importance of audience data, what about harnessing data on advertisers' buying behaviour? Data is everywhere - at home, at work and in practically every facet of life. The huge influx of big data available to today's publishers has created enormous opportunities, but it has also created challenges. But Lineup Systems founder and chief executive Michael Mendoza - a former global IT director of Metro International - says with so much data coming in, it is difficult to identify what matters and what doesn't. "While advertising spend data alone cannot drive new business, it can unlock key insights that help your sales team uncover opportunities you might otherwise be missing," he says. With lessons learned on harnessing the power of advertising spend data from media titles across 33 countries, Mendoza cites the case of a large US publisher that wanted to revamp the lead generation strategy of its advertising department. "It loaded three years of historical booking information for each of its advertisers across all of its publications into a centralised sales system. "Consolidating this data into a single repository enabled the publisher to analyse booking information from hundreds of publications - each of which was historically operating and interfacing independently with customers," he says. • the advertisers that spent >$30k in the largest daily, but have not spent any money in a regional title. "Lead generation concepts like these, and hundreds more, proved to be immediately impactful for this media company because we created immediate leads in the CRM system for their sales team to chase. Additionally, sales management was able to monitor which sales reps followed up on the leads, and how effective they were at closing the deals. "Not only is this media company now able to act in real time on the business intelligence they are gleaning from their data, they also achieved a four per cent increase in digital ad revenue last year as a direct result of this strategy." With trends moving fast, and new competition and innovation within existing competitors every day, you need to connect with your advertisers in a whole new way to stay ahead. Mendoza says some of Lineup's savviest customers are importing Neilsen, TNS and other third party advertising spend data into their media sales solutions and using this data to analyse how much their advertisers are spending with them versus their competitors providing valuable insights into what their customers are spending on advertising, just not with them. "Bringing in this third-party data, they can see what per cent they are selling against in each market segment, and in which segments they are more than five per cent behind their competitors - they then generate leads for all their sales reps with advertisers in those segments in order to chase (and close) the sales gap," he says. Advertisers that spent more than ten per cent with their top three competitors can also be identified and a lead is generated for the sales rep. Ad performance studies can also be used to show that your titles reach a better audience with better response rates than your competitors. Mendoza says a holistic view of "what, where, and when" their customers are spending is delivering huge wins for many Lineup users. "A great example is a leading Danish publisher who implemented a system that brought in third-party competitor data on advertising spend on a daily basis. Every morning this publisher's sales team would start their day by reviewing every ad campaign that started the day before. If they were not involved, they would contact the advertiser and try to steal the advertising budget from the remaining campaign. They achieved a 20 per cent win rate with this strategy. Knowing which campaigns had not been placed with them - and with nothing to lose - their three-person sales team would work to get involved in the campaign. A Swedish customer with a new jobs website had their IT team create a tool that grabbed data from the country's top three job websites so they could call the advertiser anytime a job was posted. This simple sales tactic delivered a 30 per cent conversion rate! As the 'ad pie' continues to shrink, tomorrow's leaders will be those who succeed in sales today. 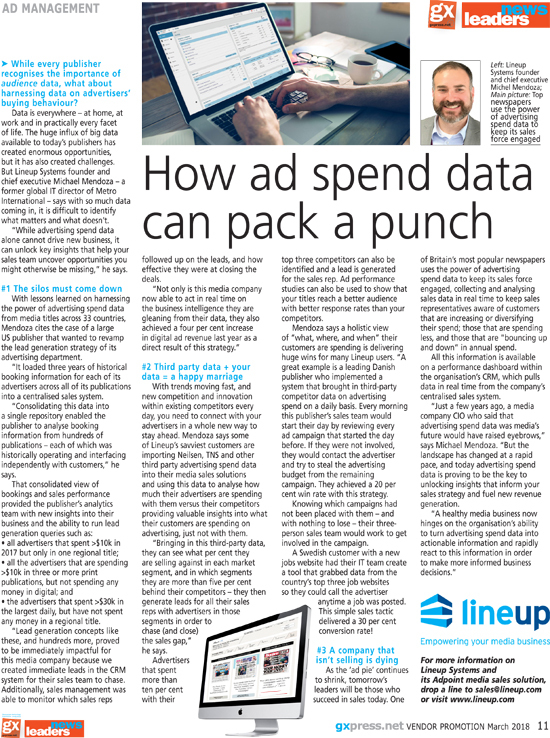 One of Britain's most popular newspapers uses the power of advertising spend data to keep its sales force engaged, collecting and analysing sales data in real time to keep sales representatives aware of customers that are increasing or diversifying their spend; those that are spending less, and those that are "bouncing up and down" in annual spend. All this information is available on a performance dashboard within the organisation's CRM, which pulls data in real time from the company's centralised sales system. "Just a few years ago, a media company CIO who said that advertising spend data was media's future would have raised eyebrows," says Michael Mendoza. "But the landscape has changed at a rapid pace, and today advertising spend data is proving to be the key to unlocking insights that inform your sales strategy and fuel new revenue generation. "A healthy media business now hinges on the organisation's ability to turn advertising spend data into actionable information and rapidly react to this information in order to make more informed business decisions."